2018 Topps Stadium Club Baseball loves the photo. The world of sports is filled with dramatic and dynamic photography. 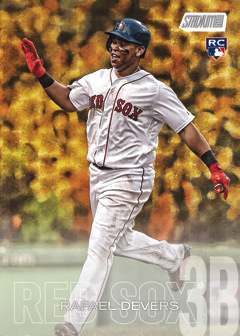 Some of that is captured on sports cards, but a lot of the times they’re vying for attention with other design elements. 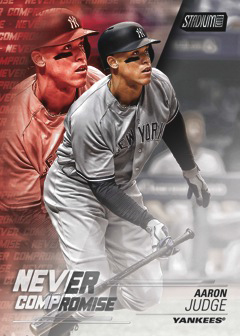 Not 2018 Topps Stadium Club Baseball. The set’s focus is clear. Great photos. Other elements are in packs as well, like the promise of two autographs per hobby box. But, overall, the product sticks with what made it such a hit when it first arrived in 1991. The base set keeps the design to a minimum. Full-bleed fronts allow the picture to cover the front. The nameplate is done entirely with text and even that is largely see-through. With 300 cards in the base set and approximately 112 base cards per box, set-building will require some trading among friends (at Sports Cards Plus, trade night is 24/7). It may not be the biggest checklist of the year, but it is large enough to make it something of a challenge. And with many collectors looking to the photos, that’s a chase in its own right. Parallels come in several levels. Black Foil are the most common, landing two per hobby box. Others include hobby-only Black and White (1:48 packs), Red Foil, Rainbow Foilboard (/25), First Day Issue (ten copies each), Members Only (one per case), Photographer’s Proof (1:2 cases) and Gold Rainbow Foilboard (1/1). Like Black and White, Gold Rainbow cards are only in hobby packs. Stadium Club Chrome returns for a second year as a partial parallel set. A total of 90 cards are given the chromium treatment with one base version landing every hobby box. Chrome parallels include Refractors (1:64 packs), Gold Minted (1 per case) and one-of-one Superfractors (1/1). 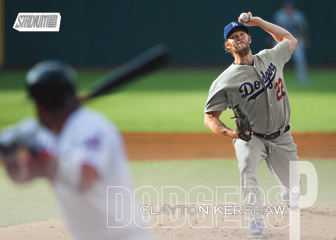 Select Chrome cards also have autographs that have ten copies or less and Superfractor Autographs (1/1). 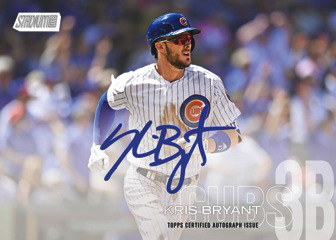 Of the two autographs per 2018 Topps Stadium Club Baseball hobby box, most fall under the Base Autograph banner. These take the same general design of the main set and have on-card signatures. Parallels come in Red Foil (/50), Black Foil (/25), Rainbow Foil (/10) and Gold Rainbow (1/1). Rainbow and Gold Rainbow are only in hobby packs. A couple of scarce autograph inserts return for another year. Co-Signers (/10 or less) have signatures from a pair of stars. Lone Star Signatures are also back. Both have one-of-one Rainbow Foil parallels. 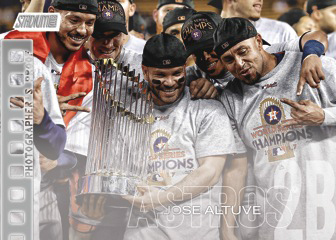 Lone Star Signatures also have Orange versions (/5). 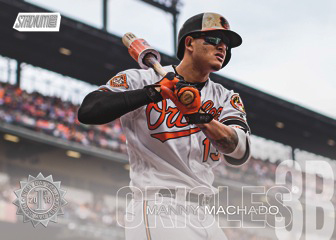 2018 Topps Stadium Club Baseball regular inserts use names and themes from the brand’s early days. Beam Team, perhaps the most famous Stadium Club insert ever, is back for another season. 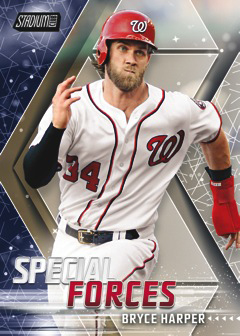 Landing one per box, the checklist has 25 top MLB players. Power Zone (1:8 packs) and Instavision also return. Instavision is a case hit that has Red (/50), Black (/25), Orange (/10) and Gold Rainbow (1/1) parallels. Never Compromise (1:8) and Special Forces (1:8) both debuted in the 1990s but haven’t been seen since Topps brought back Stadium Club in 2014. These, along with Beam Team and Power Zone, have Red, Black (/99), Orange (/50) and Gold Rainbow (1/1) parallels. Select Beam Team, Never Compromise and Power Zone cards also have signed versions. CO-JR Derek Jeter/Cal Ripken Jr.